Four hundred and fifty five light years away sits a newborn star that bears striking resemblance to our Sun. It’s awash in a sea of complex organic molecules which could, one day, coalesce to form proteins, nucleic acids, even life itself. 4.6 billion years ago, our baby Sun was also surrounded by a cloud of gas and dust. We know from looking at comets—which are like artefacts from the solar system’s formation—that this “ protoplanetary disk” was filled with water and organic molecules. Now, using a powerful telescope that’s able to detect tiny wavelengths of radiation emitted naturally from molecules in deep space, Harvard astronomers have learned that the disk surrounding the million-year-old star MWC 480 is likewise rich in life’s simple precursors, containing enough methyl cyanide to fill Earth’s oceans. Astronomers have known for some time that interstellar clouds are very efficient factories of organic molecules. Cyanides, and particularly methyl cyanide, are important precursors to the amino acids that form proteins. But until now, we’ve only observed these lonely organics in the cold, dark depths of interstellar space, and it’s been unclear whether they could withstand the powerful radiation emitted by a young star. For MCW 480—a star twice as massive as our sun—organic molecules do more than survive. The sheer volume of methyl cyanide surrounding the young star tells astronomers that organic molecules are forming very quickly, outpacing the radiative forces that naturally break them apart. 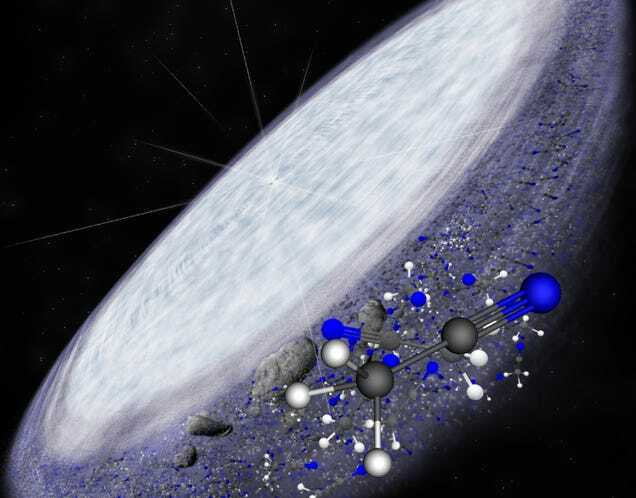 As this solar system continues to evolve, the researchers speculate that some of its organic molecules will become safely locked away within comets, and perhaps ferried to other environments that are more conducive to life. So, note to humanity’s cyborg descendants: check back in on MCW 480 in another 5 billion years or so. We might just find someone staring back at us. Read the full scientific paper at Nature.